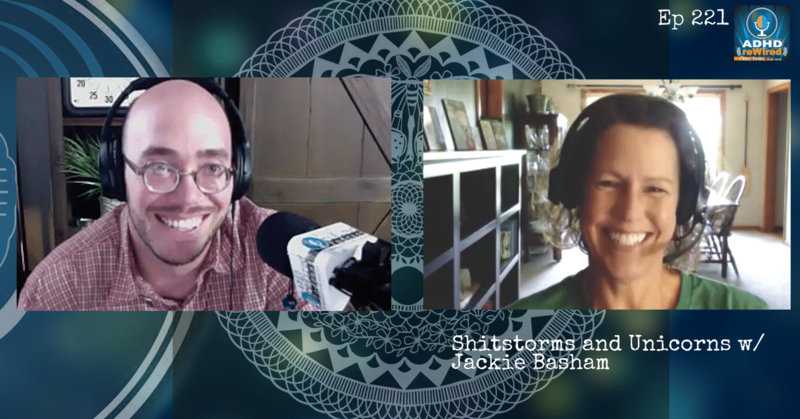 Jackie Basham joins me on the podcast this week. Jackie is a wife, mother, and grandmother. She has a degree in public health, and scattered around her house are several certificates of graduation. She is an artist and currently has art hanging in two galleries in Springfield, Missouri. She is a substitute teacher and maintains her sanity by running, yoga, and nature. Jackie has probably prepared about 8,000 meals in the past two decades. In this discussion, you will hear Jackie tell her ADHD story, and she shares some of her personal philosophies. You’ll hear how Jackie developed these philosophies and strategies, and how she has (and sometimes hasn’t) been successful with them. [07:27] – At age 49, Jackie realized she has ADHD. This was when she hit the wall of awful. [10:25] – Jackie shares a story that is a perfect example of her black and white thinking. [11:42] – Learn as much as you can about about ADHD and your own ADHD. [14:35] – Jackie explains how she learned everything she could about ADHD, which included listening to a lot of podcasts. [15:35] – Jackie shares how she takes what she learns and puts it into practice. [19:10] – Jackie describes the things that have been vital for her healing. [20:43] – Criticism and a lack of affirmation in childhood contributed to Jackie’s story. [22:57] – We talk about letting go of comparison, and focusing on the right things. [27:00] – Jackie talks about the transition away from being a mom. [31:35] – Jackie experienced failure on a daily basis with getting her stuff together. But now she’s rewriting that narrative. [34:42] – It’s all about progress, and Jackie shares how she’s struggled with certain aspects of ADHD coaching. [37:18] – Jackie says that scheduling software would help her and her clients with ADHD coaching. [39:04] – A lack of marketing and self-promoting is something that Jackie feels holds her back. [46:07] – We talk about making things more complicated than they need to be. [53:17] – An auto-scheduling tool is essential for people with ADHD who schedule appointments with clients. [54:28] – We come up with a list of things Jackie needs to do to get squared away with her coaching. [59:43] – Jackie shares how to go from the sh*t-storm to the the unicorn.